Yesterday i was thinking about a past post concerning film noir while I was watching Akira Kurosawa’s Stray Dog (1949). In it I explored the nature of character and characterization in The Matlese Falcon (1941). This morning I received a very interesting comment from Tony D’Ambra, the man behind the rather good Film Noir.net, concerning a few points he wished to pull up. 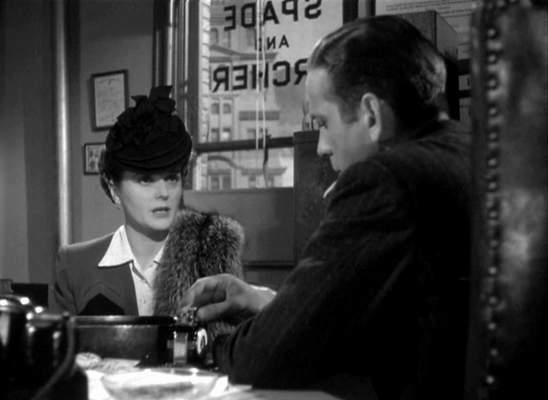 One major point he made was his belief that The Maltese Falcon‘s Sam Spade was a true film noir P.I. On further contemplation I believe that I should inlight of my own post concerning the nature of genre make a short note on the Film in-question. Although I believe that Sam Spade lacks that spiral into death or dishonour that a femme fatal brings it is true that I was concentrating too much on that precise element of film noir (it happens to be one of the most fruitful elements of film noir due to the ability of the critic to analyse it from several different angles) for my analysis of The Matlese Falcon. As I mentioned in my post concerning the nature of genre, all genre’s are family-resemblance concepts and therefore certain elements can be missing or excluded from a film because an element is not definitivly included in all.